LIMERICK CITY AND County Council is currently reviewing a number of submissions it received in relation to a large new development in the city which will not contain any residential units, despite the fact that the council said it would two years ago. However, plans presented to council members in June did not include a provision for accommodation of any kind. The council told TheJournal.ie that it received 27 submissions as part of the public consultation process which ended earlier this month. These submissions will be reviewed and compiled for a report that will later be presented to the council. One of the organisations that made a submission to the council was Novas, a voluntary agency in Limerick that works with people who are homeless or at risk of becoming homeless. Considering the huge dearth of accommodation to rent and buy in the city, we find it alarming that plans for such a massive city centre development on land owned by the local authority does not include accommodation. She pointed out that on the day of the submission, 2 September, there were just five apartments to rent on Daft.ie in Limerick city. None of these properties were one bed properties. “One bed properties are impossible to source in the city and must be prioritised in any construction plans,” she said. Working on the frontline of homeless services in the city, we are acutely aware on the need for more city centre accommodation. On a monthly basis we work with 107 families who are homeless or at risk of homelessness (a jump from 40 families per month in 2015). There are almost 70 families in the city living in B&B accommodation, which is wholly unsuitable for young children, with huge lasting implications. Our Temporary Emergency Provision, which was only opened last December to deal with the excess numbers accessing existing temporary accommodation in the city, is turning away adults on a nightly basis. Five or six people are turned away each night and provided with bedding from the staff of McGarry House, an entirely inadequate response to their needs. We anticipate that this will only get worse in the coming months. 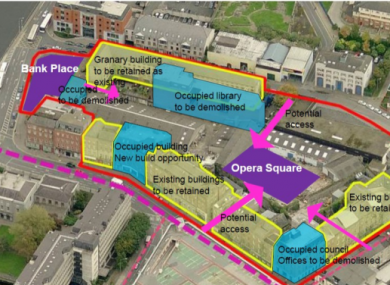 Burns said the Opera site provides an opportunity to offer more accommodation in the city and alleviate the growing pressure on the private rented market. “This accommodation can support young professionals, small families, students and city centre workers. Any additional accommodation will ultimately support the most marginalised, by alleviating pressure on existing housing in the city,” she said. She also pointed out that the people working in the new office spaces and shops on the site will need somewhere to live and the development could, in fact, “exacerbate the housing shortage in the city”. It questioned what will have been achieved in terms of regeneration if there are thousands of workers travelling into the city centre in the mornings and leaving in the early evening to homes in the suburbs. In another submission, a local resident wrote of returning to the city with his son after living in London and Dublin for a number of years. “Both are vibrant cities with a complex structure of residential, retail, business and culture at their core. I miss this dynamism terribly and have always been acutely aware of Limerick’s lack of such soul in the city centre,” he said. As an art graduate and a lover of culture, I had always hoped that I would help affect change in my home city and I hope this is my chance. If you allow for a variety of society to live centrally (professionals, creatives, families and other who are so intrinsic to the lifeblood of any city), they will bring a vibrancy back in the evenings that has been missing since I was teenager. They will spend money in local shops, they will visit local restaurants and bars, they will use cultural centres and they will encourage independent businesses to open and thrive, which is what make large cities so exciting. “Developers are not philanthropists they are businesspeople and they will always choose a larger profit margin on a new suburban retail/residential development than have to skirt the planning issues of inner city development. Local Solidarity councillor Cian Prendiville also made a submission to the council in relation to the development. “I am deeply concerned about the complete absence of any residential accommodation included in this plan,” he wrote. Prendiville expressed concern that the area could become a “deadzone” after 6pm and on weekends when offices are closed. This is a great opportunity to provide quality, affordable accommodation in the city centre, making the city a great place to live, work and socialise. The Green Party’s Rachael Fagan also raised the lack of housing provision in the plans in her submission to the council. “This is in the midst of a national housing crisis with a dearth of affordable properties, particularly in the city centre. As a city, we will not have an opportunity for the redevelopment of such a large block of land in the city centre in the foreseeable future,” she said. Another Limerick resident Aprille Scully referenced the three homeless people who died in one week recently. “At the moment, the lower rents are found in the privately rented slum bedsits in the Georgian quarter which are unacceptable living conditions,” she said. She also expressed a view that including residential units would make “taking walks along the quays more safe and less lonely”. Please do not allow the Limerick 2030 plans to go ahead as proposed otherwise apart from the fact the facade of the building might be improved, I’m sure that area of the city will be as dead and lifeless as is it now. We need housing immediately – this point cannot be laboured enough. ‘Project Opera’ is being undertaken by Limerick Twenty Thirty, a strategic development designated activity company (DAC) tasked with developing a number of key sites in Limerick. In a previous statement to TheJournal.ie, Limerick Twenty Thirty has said that, in parallel with that, it will be working with relevant stakeholders with regards to Limerick’s residential requirements. Email “'It's alarming': Outrage over decision to remove housing units from Limerick development plans”. Feedback on “'It's alarming': Outrage over decision to remove housing units from Limerick development plans”.